MB I chose it because of everything about it. I came across it at the end of a really beautiful experience and I think what is so poignant about it is the way that it’s shocking: it’s so delicate and challenging and toys with your expectations. Once you’re over the shock it’s awe-inspiring. I was very lucky to be shown around the Biennale by David Adjaye who designed the Arsenale buildings. He’s so passionate about art. If you ever want someone to show you around an exhibition, it’s him. He worked very closely with Okwui Enwezor, the Biennale’s curator, so he knew a great deal about the work and curatorial vision behind it and we had a great, intense, super-cerebral afternoon debating everything. The Sarah Sze was the last thing we saw and what I loved about it was that we’d seen all these powerful statement pieces of really intense expressions, declaration and feelings. The theme is the World’s Future so a lot of it is artwork that denotes a presence or a voice that isn’t part of the ‘traditional’ art dialogue. It was a beautiful day, 25 degrees, the air there is so clean and nice and we walked into this garden and stumbled across these pieces that take you so much by surprise. You see string and plastic water bottles but you look at what she’s done with them and realise that she’s framing nature in a subtle but extremely powerful way. She shows you that there’s beauty in everything and it just depends on how you look at it. The hammock piece is like a dream catcher but it catches petals. It’s like a space to lie down except it’s for leaves or ideas, even. Beauty is transient so it reminds us of death and therefore the need to make every moment precious while we’re alive. But she also uses elements that are eternal like light, air and water to explore how we exist in our ecosystem. Venice is such an interesting city because it’s a speck of human energy that’s up against a tide of natural power. Every stone is a challenge. It’s tragic and beautiful at the same time. GB I think the Biennale emphasizes that because there’s so much art exhibited in run down palazzos. Contemporary art looks so good in that setting. MB Exactly. But we must all remember that it won’t be there forever. I love that Sarah Sze weaves her man made materials into nature to see how they interact because we’re all part of the same ecosystem. Your mobile phone and that peach and the seaweed, it’s all the same. It’s all connected. GB It feels very feminine somehow. MB Yes, I love the female energy about it. And I love that the work gets stronger as the trees get bigger and more petals fall onto the hammock. She’s drawing our attention to an energy and an activity that exist, like drawing a little circle around a portal. There’s a piece inside a well that you can only see in a mirror suspended above it and that’s so poetic, it’s like a dream. We’re all constantly searching for beauty, looking in mirrors at our own appearance, but she presents us with this mirage. I saw her show in London at Victoria Miro, with these delicately balanced sculptures of wood and stone. But the Biennale is so noisy and there’s so much happening it’s quite brave to create this delicate work. GB So the context changed the way you saw it? MB Well I was lucky enough to have a guide who explained the whole curatorial narrative. GB Did the fact that it was in the Biennale help to validate it? What would you think if you wandered into it in London Fields? MB I’d think it was some random hippy art! What’s important about art spaces is that they put a box around something. It doesn’t have to be a Biennale. It can be a gallery or you can even just make a declaration, but it helps you to remove your standardized judgements when you cross that threshold. You’re ready to look at stuff in a different way. 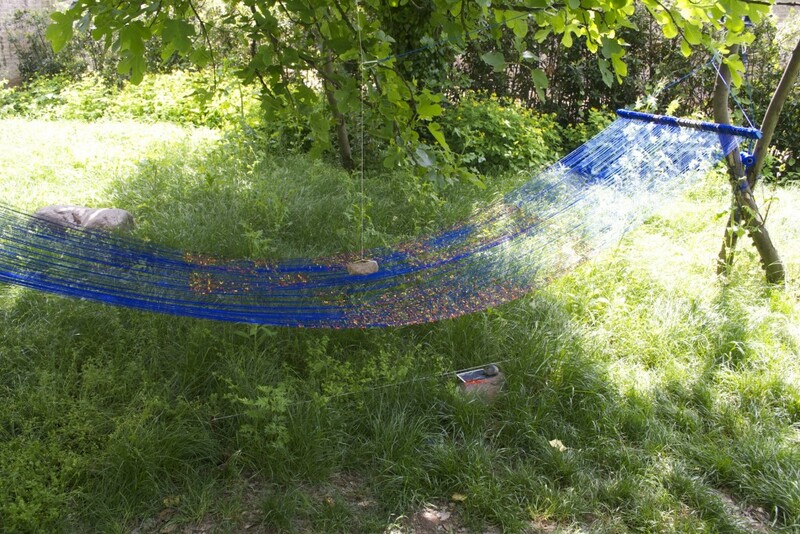 What Sarah Sze does, is empowers you to see everyday things in a more beautiful or artistic way. I admire that she has the confidence to make something that simple. It takes balls. She has so much conviction. GB Do you find beauty in the mystery of it? That it’s like traces left behind and you don’t know the full story? MB Definitely. It’s like end-of-the-world DIY, like the remains of some ceremonial camp. GB Is it one of those things where you’re looking at a plastic bottle trying to work out if it’s a piece of trash or part of the installation? MB Yes and that’s such an amazing thing to think. It makes you question everything and that’s what art is good at, encouraging you to be in the present. GB So it is quite intellectual for you, the beauty in this? MB Yes but then I did find it visceral. I really felt the beauty when I was there and thought more about it later. Venice is a bubble where you can explore new things. It’s not the real world but that’s okay. GB Is a beauty a self-conscious part of your own work? MB Yes, I make my work quite decorative as a way of engaging with people. When I was at college I felt a bit ashamed of that but I read an essay in a book by Max Bill, called Form, Function, Beauty = Gestalt. It’s all about the functionality of beauty. It’s so much easier to assess functionality than beauty. “Does it work?” is an easier question than “Is it beautiful”? GB What is beauty’s function? MB It’s to get you, to reach your soul, like being in love or being in the sun. GB Tell me more about your work. MB Technology and sustainability are things that make our age interesting to me, but they’re not always nice things to talk about so I use aesthetics as an access point to get people to talk about them. I use fun, play and beauty to draw people in. Now I think I’m doing that in a more subtle way. I’m working on a project called WET, which is an emotional response to climate change. It’s a research-based project with a questionnaire at the heart of it, asking questions about what living on the water in the future will be like. I think we’re going to be living in a very different way by the time I’m old. Climate change is very real. I feel like I’m going to be living on the water. Aesthetics is always used to tell a story. Christian art was just graphic design for God. Now we’re in a situation where visual communication is for getting people ready for a huge shift in the way they live and give them space to imagine what that will be like. So I make animations based on the answers to the questionnaires. It’s all online so you can play and explore and be stimulated in a virtual space. I had a show of this in Venice in May where they really do have a water-based future but it’s all decided on by a male, white, educated elite, so I wanted to widen the number of voices engaged in this. There are some really poetic answers so beauty is important in the work I create in response to those. MB I think it can be anything as long as it’s true. It’s a mixture of powerful and delicate.